This special book is a perfect collaboration between artist and publisher. Tom Underhill designed and created a unique showcase for JoAnn Cowans’ paintings that show his understanding of her work. Enlarged details show off JoAnn’s brushwork, and paintings spread across the background carry a flow of the atmosphere and color. The book itself is a work of art. 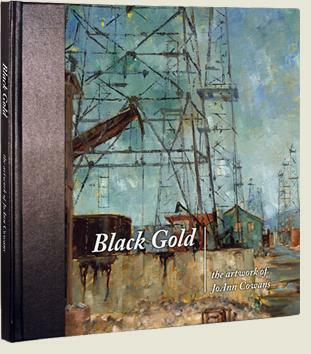 This unique 12x12” book features oilfields but also shows paintings of more traditional scenes, still life and flowers. Each is accompanied with the story surrounding the art. Forty-three of her originals are shown in color. Limited edition of two printings. Limited number available. Specialty book binder retired. Current price $400.00. Subject to change.